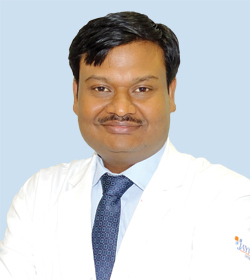 Dr. Sinha completed MS (General Surgery) from Banaras Hindu University. Subsequently he did MCh (Neurosurgery) from PGIMER, Chandigarh. Dr. Sinha has experience of teaching & training of DNB & postgraduate students. He has several papers papers published in various national and international journals. He has ongoing basic science researches in neuro stem cells and neuroinflammation. Dr. Sinha is experienced in performing a wide variety of vascular neurosurgeries like aneurysm clipping, micro vascular decompression, AVM resection, etc. He is expert in doing surgeries for brain tumors, epilepsies, spinal deformity, neuro and spinal trauma, peripheral nerve surgeries. He has also performed many cranial endoscopic procedures & like to do endoscopic assisted neurosurgery.